Who: My name is Dana Spohr and I’m pictured with my then 3 month old son, Joseph Conrad Spohr V. On this day we were surrounded by family including my sister Blair who was in from LA for the month (photographer), my stepsister and her adorable son, aunt, uncle, mom and stepfather. Where: We spent the day poolside in Edgewater swimming, looking at breathtaking views of Manhattan and preparing for the Thursday night Hudson River concert in the park. What: I am wearing Joseph in my sister in law Lizzy’s awesome ringsling which she let us borrow when Joseph was born. It is like that old teeshirt you always want to wear…soft, broken in and always looks great. It has become a daily staple in our lives. We both feel very comfy with this wrap and this pic captures Joseph sucking his thumb for the first time in his SHARK sunglasses which cracks me up. Why: We are lucky to have had strong babywearing women in our family who have promoted, educated and shared with us. It has brought me and Joseph closer together in both good times and bad, happy, crying, gassy, sleepy, etc. 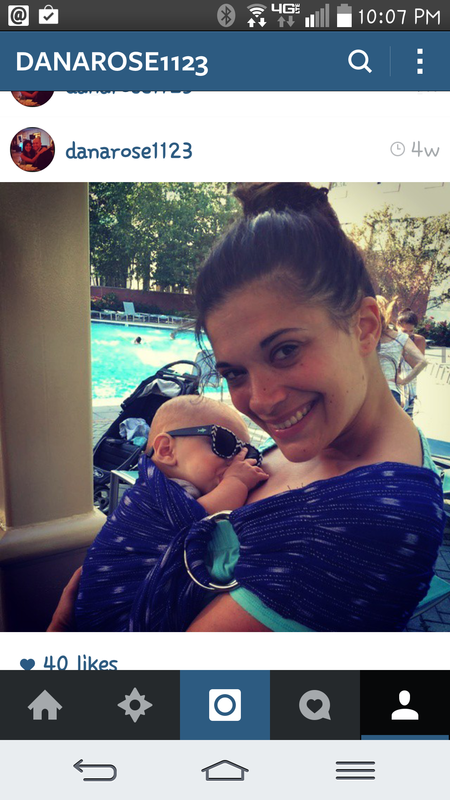 I am so excited to use some thicker wraps this Fall and expand in our baby wearing experience.